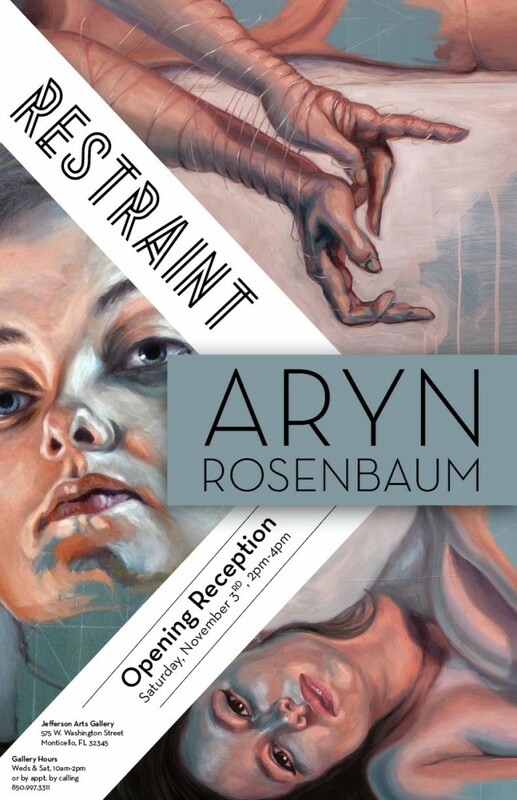 Come see Aryn Rosenbaum’s first solo show, RESTRAINT, at Jefferson Arts Gallery featuring her large scale figurative oil paintings. The opening reception is Saturday, November 3rd, from 2pm to 4pm at Jefferson Arts Gallery in Monticello, FL. The gallery is located on the corner of W. Washington Street (U.S. 90 E.) and S. Hickory Street (575 W. Washington St.). Parking will be on the left after you turn onto S. Hickory St.
Refreshments & great conversations provided! If you can’t make it to the opening, the gallery is open every Wednesday and Saturday from 10:00 am to 2:00 pm or by appointment.